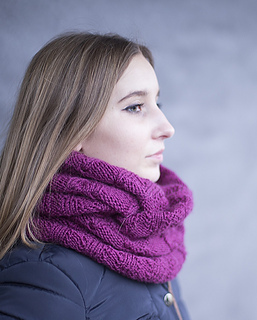 “Hit the Road Cowl” is a stylish accessory that can be worn for warmth and for fashion. Knit all in one piece, from the bottom to top, using the same cable stitch - this cowl can be beautifully paired with the “Hit the Road Hat”. * DROPS Karisma Superwash (100% Wool) 50g/ 109 yards (100 meters); 6 skeins or approx. 550 yards 503 meters of DK weight yarn that knits up to gauge. The sample is knit with Dark Old Rose (39). 43.25” 108 cm in length and 13.25” 33 cm in width.